1933-1991 Mallory & Irvine Research Expedition, 1999 Where Did Odell See Mallory & Irvine? Second Search, May 1999 Conrad Anker's Near-free Ascent of the Second Step Mallory & Irvine Research Expedition, 2001 Was Andrew Irvine Found in 1960? What Happened to Mallory & Irvine? 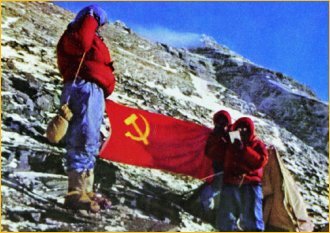 May 30, 1933, Everest Northeast Ridge, 27,725 ft.
"It seems probable that the axe marked the scene of a fatal accident. [...] Neither climber would be likely to abandon it deliberately on the slabs, and its presence there would seem to indicate either that it was accidentally dropped when a slip occurred or that its owner put it down possibly in order to have both hands free to hold the rope. The slabs at this point are not particularly steep, but they are smooth and in places have a covering of loose pebbles which are an added danger. A slip might easily occur, and would be difficult to stop. [...] Below, the slabs steepen considerably." 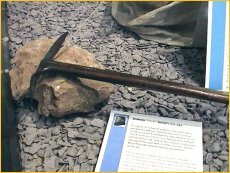 "It seems to me very possible that one of them - and more plausibly Irvine, who was less used to carrying an axe on a rock-climb than Mallory - may have decided to leave his axe on the ridge during the ascent, to be picked up on the descent, in view of the climbing being almost entirely on rock under the conditions prevailing at that time; one axe would be retained by the party in case of eventualities, a practice by no means uncommon on Alpine rock-peaks." In 1963 it was discovered that a triple nick on a military swagger stick, found among Andrew Irvine's possessions, matched a similar mark on the ice-axe's shaft (Odell, N.E. "The ice-axe found on Everest in 1933", Alpine Journal, 68, 1963). 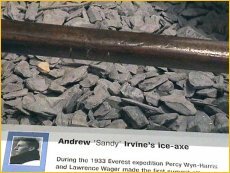 It is therefore highly likely that the ice-axe had belonged to Andrew Irvine. The day after his revelation to Hasegawa, Wang and two companions were killed in an avalanche below the North Col.
Hasegawa later recalled Wang had indicated that the mouth of the corpse had been agape, one cheek sunken or pecked by birds. When Hasegawa had written in the snow, "8100 m - dead English body", Wang had given a big nod (quoted in Salkeld, A. People in High Places, p. 130). Because only two climbers had been missing around that altitude on Everest's North Face prior to 1975, the "English dead" must have been either Mallory or Irvine. May 15, 1991, Everest Northeast Ridge, 27,800 ft. 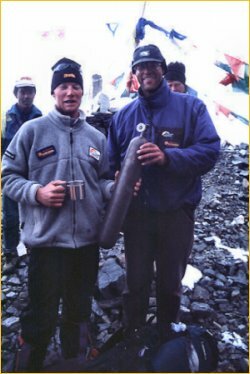 Eight years later, on May 17, 1999, American Tap Richards recovered the bottle from the Northeast Ridge. The oxygen cylinder is 1 ft. 11 inches long and 4 inches in diameter, weighing 6.5 lbs. The bottle is undamaged, the rusty steel cylinder bearing remnants of a paint mark: "9", the individual number of the bottle, and the weight units "lbs" and "oz". A stamp on the valve also indicates the cylinder's number, 9. Comparisons with pictures and documents of the Royal Geographical Society, London, prove that the bottle stemmed from the 1924 British Everest expedition. Only one party in 1924 had been using oxygen and could have passed the spot where the bottle was found, so it must have belonged to Mallory and Irvine.